First of all, every tech lover knows that a USB Hub is a device that allows you to expand one usb port into several ones. This has become the method of choice to charge a wide variety of battery powered devices like tablets, cell phones, consoles, cameras, smart watches, among many others. Many devices we depend on daily only counts with 2-4 ports, and that’s just not enough. Thanks to this you can connect more than one device to your PC or Laptop. This product is so innovating and modern that everyone is trying to get one or already has one. A USB 3.0 Hub is normally used to connect devices such as a mouse, a keyboard, a monitor, and even a printer. Thanks to it, you can have them all connected at the same time. In Dodocool, there are many models of USB 3.0 Hub that you can purchase. They are highly recommended by every consumer that has had the opportunity of purchasing one in the past. This product provides 3 USB 3.0 Type-A data transfer ports, 1 GB Ethernet port and 1 USB-C PD charging port via a single USB-C port. In addition, each port supports a data transfer that goes up to 5 Gbps (640MBps). If you are still using the device connected to the USB Hub but need to charge it, you can connect your laptop or main device to the USB 3.0 Hub and to that one you can connect the Dodocool USB Charger. Furthermore, this device is compatible with Windows 10, 8.1, 8, and 7. It is also compatible with a Mac OS X operating system and its ports are compatible with USB 2.0 and 1.1. It has a very light weight and modern look so it fits to almost every PC or Laptop and will make them look elegant and organized. You should know that the transmission speed is set by the setting of the device connected. If you want to connect to your laptop you have to make sure they are compatible. 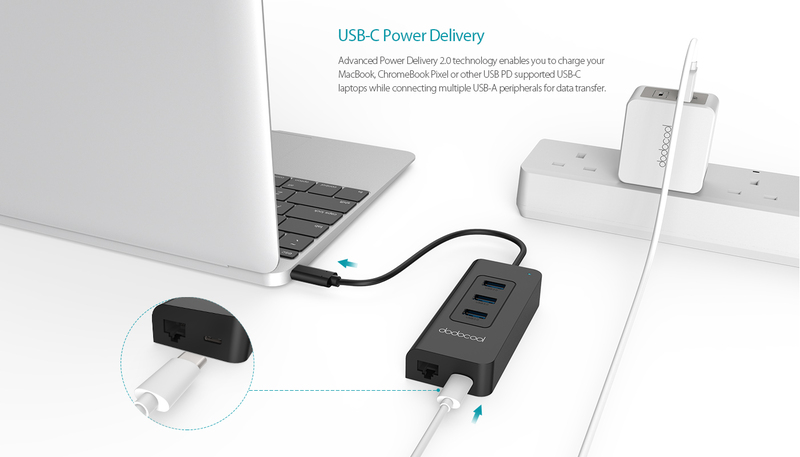 The main brands compatible with the USB Hub are the Google Chromebook Pixel, the Apple New MacBook, and the Huawei MateBook, among others. On the other hand, is not compatible with any Samsung Tablets or ASUS Zenbook UX330UA. To ensure the safety of the USB Hub, and the connected devices, use a high-quality protected USB 3.0 cable or connector. This way your devices will not suffer any electrical damage. Its size is approximately to 4.14 * 1.82 * 0.81 in / 105.07 * 46.22 * 20.58 mm; and its weight is close to 2.26oz or 64g. It also brings an instruction manual in many languages such as English, French, German, Italian, Japanese, and Spanish.